Delighted to report that Hammer continued our strong run against whipping boys Battersea, cruising home 3-1 on the night, with all players undefeated. On top board, Nadhmi had a level game as white until he lost his a-pawn, then had a complicated exchange involving losing another pawn and a rook, but winning knight and bishop. This lead to a tense knight & bishop ending vs. rook and 2x pawns in the 20 minute quick playoff. Nadhmi defended very well, but then lost his knight just before his opponents flag fell. So, although his opponent “lost” on time, Nadhmi no longer had mating material, so it was a technical draw. On board 2 as black, I played the Sicilian O’Kelly variation and won a pawn in a very positional middle game. I then gained another as we swapped off pieces to a won endgame, rook and 4x pawns vs. rook and 2x pawns. On board 3, Chris had a rollicking game as white, with his bishop check winning a pawn on e6 which looked like winning a piece. However, Chris played a queen advance looking for an elegant tricky mate which didn’t quite work out – he emerged a piece down, but later the opponent overlooked a rook capture which couldn’t be recaptured, while his other rook was pinned against his own king, and Chris emerged victorious. Ben’s game as black was even until his opponent obtained a supported passed pawn on d5, but in exchanging pawns and pieces at the end of the middle-game, the passed pawn was captured leading to a drawn ending. Our first game of 2018 was an emphatic win for Hammersmith Hedger, 3.5-0.5, in another game where we went undefeated across all boards. On top board, Robin held a slight advantage with the white pieces throughout. On being offered the draw, he accepted. Board 2 saw Nick play a splendid attacking game with black, against an opponent graded 121. This was an excellent win. 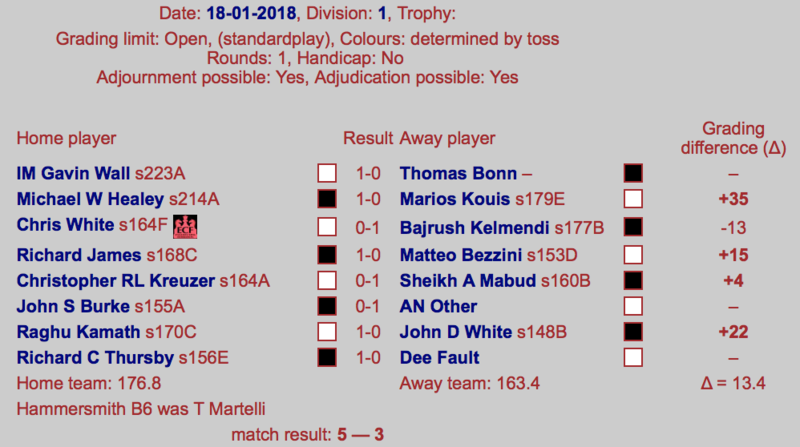 Board 3 saw me win by default thanks to a no-show – they all count! On 4, Dan with the black pieces played a super Sicilian. It was a classic “game of two halves”, with white holding the advantage until Dan trapped a piece. Then with some excellent tactical play, he forked King and Rook to win. Brilliant. With a somewhat confusing scorecard, Hammer ended up losing this one 5-3, featuring a couple of defaults. Always sad to see! In truth, Richmond put up a very strong team so it would always have proven tricky. Our 4th Round RapidPlay games continue this month. Most games are now complete, but if you haven’t yet played please remember you only have until January 31st to complete the game and let the tournament controllers know the result! 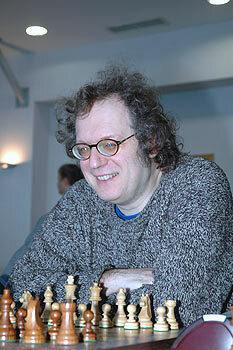 Legend of English Chess, GM Jon Speelman joins us on 26th February for an evening dedicated to the beautiful game. Jon will be guiding us through some of his top-level play, followed by questions & discussion from the crowd – it’s going to be a real one-off, and isn’t to be missed! The Return of the Hammersmith League! It’s been a long time coming, but we will shortly be announcing details of the all-new Hammersmith League, with the first games kicking off in March! The Hammersmith League was always an informal setup featuring a few local clubs, aimed at providing competitive chess opportunities for our more casual players, and beginners. The perfect environment to ease yourself into the cut & thrust of competitive chess. Whilst it was always about the enjoyment of the game, the edge was always there, with all games graded and no quarter given. We’re pleased to say that ethos will still prevail in the new format, where Hammersmith will be joined by Battersea, and SW London Juniors, for 3 nights of chess in March & April, all to be held at The Anvil. Games will be 30 minutes + increment for all moves, graded, five players per team, with a grading average below ECF 115. Yes, it’s that time of year – the ECF has released it’s semi-annual update to the grading database! Please follow the link below to find out who the movers and shaker are this time.. The chess comes at us thick & fast this next two months, so keep an eye out for any emails from your team captains, and updates from the website so you don’t miss out! There’s always the WhatsApp group too if you can’t get enough! And keep your eyes peeled for details of a soon-to-be-announced day out in Bury St-Edmonds… chess-themed, of course!! Stay tuned! Next Next post: A January Corker!